The Hand-Carved Gothic Furniture Range. 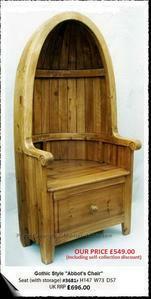 All items hand-made and hand-carved from reclaimed pine, then hand-waxed to a rich antique pine finish. A unique range of Gothic Style Furniture, beautifully hand made and hand carved by skilled craftsmen. Because it is made from reclaimed pine it has an authentic antique look to it, and indeed may have the occasional split, dent or other characteristic normally associated with an original antique item. Some stock of this range is readily available, but due to demand and workload involved in hand-crafting this range, there can often be a wait for some items to be hand made. With this range, the workshop WILL NOT make special sizes, special orders, or special finishes unless ordered in relatively large quantities. For minor alterations, height, shade etc. it is occasionally possible for us to do this in our own workshop at an extra charge. Feel free to enquire. If you are looking for Gothic Style furniture which can be made to special sizes/specifications and finishes, you would be advised to contact us regarding our own MINSTER GOTHIC range. All items are priced for collection from our showroom in Driffield, East Yorkshire, UK. However we are happy to arrange delivery throughout the UK and Worldwide at cost price. Feel free to contact us to discuss delivery arrangements. (A short note regarding the Durham Pine Gothic Colllection. with the only significant difference being the use of metal handles , as opposed to the wooden ones on the Keen Pine Range. Hence if you are searching for items to complement your existing Durham Pine Gothic items you willl find the KeenPine Gothic items an excellent match. If it is important to you we could probably even source similar metal handles for your purchases. Only one left for immediate despatch! One in stock for immediate despatch/collection! Two in stock for immediate despatch/collection! Available in Left and Right -handed versions. Use the contact button in the menu bar above to get in touch with any queries. section, for a wide range of Gothic Style beds, hand-made to order. This chair is so interesting, it deserves four photographs! Click on any of them to enlarge!